Provide comfort for the family of Marian Fields with a meaningful gesture of sympathy. 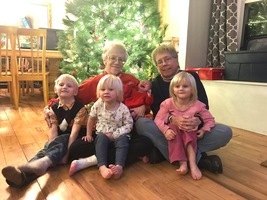 Marian Fields, 67 of Independence, Missouri, died April 7, 2019 at St. Luke’s East Hospital in Lee’s Summit, Missouri, surrounded by many family members. She died of a very rare cancer, which she fought well for two years, making numerous trips to MD Anderson Cancer Center in Houston, TX, and undergoing some drastic surgeries. Marian was born on July 24, 1951 in Coffeyville, KS, to Joe Q. and Betty A. (Miller) Fields. She came 12 minutes ahead of her twin sister, Mary Jane. Marian grew up in different cities in Kansas and Missouri, attending both Catholic and Public schools. She graduated from Ruskin High School, Hickman Mills, MO in 1969. After high school, she worked several years at the O’Flaherty Real Estate firm. She was an active member in several Civic and Professional groups. She was one of the youngest women to become President of the Women’s Chamber of Commerce in 1984. In 1979, she received her SRA designation, becoming the only woman who was a designated appraiser in the Kansas City area. 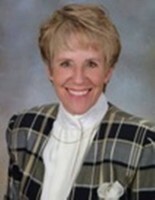 She went on to become the first female president of the Society of Real Estate Appraisers, and after the SREA merged with the other professional Real Estate Appraisal organization, to form the Appraisal Institute, Marian became the only appraiser who served as president for both organizations. Marian was also an active member and President of the Commercial Real Estate Women’s organization (CREW). In 1993, Marian received a bachelor’s degree from Park University, graduating with honors. Marian went on to become one of the few women who held a designation as a Commercial Appraiser. In 2004, she received an award to recognize her contributions to the real estate industry in general, and to the appraisal profession. Marian finished her career working as an appraiser for the GSA. She started there in 2009, and she had very much enjoyed the job and the people with whom she worked. Marian belonged to several organizations, but most enjoyed volunteering with Habitat for Humanity, and she served on the Board of Directors, as well as being President of the Truman Heritage Habitat for Humanity organization. In addition to that organization, Marian also enjoyed working as a volunteer for Special Olympics. She was a recipient of the Volunteer of Distinction Award given by the Appraisal Institute to recognize members who made a significant contribution to the community through volunteer work. Marian never married or had children, but she was very close to her family, and she is survived by her twin sister, Mary Jane, five brothers, Gregory, Hal (Iris), Joe (Carrie), Mike and Chris (George). She cherishes the relationship she has with her eight nieces and nephews and her 15 great nieces and nephews. She was preceded in death by her parents, Joe Q Fields (2001) and Betty A. Fields (1992). A funeral service will be held on Friday, April 12 at St. Mark’s Catholic Church at 3736 S. Lee’s Summit Road, Independence at 11:00 am. The Visitation will also be at St. Mark’s Catholic Church at 9:30 am. In lieu of flowers, please consider gifts to either Truman Heritage Habitat for Humanity, or St. Marks, Catholic Church. To send flowers in memory of Marian Fields, please visit our Heartfelt Sympathies Store. Consider providing a gift of comfort for the family of Marian Fields by sending flowers. We encourage you to share your most beloved memories of Marian here, so that the family and other loved ones can always see it. You can upload cherished photographs, or share your favorite stories, and can even comment on those shared by others. Provide comfort for the family of Marian Fields by sending flowers. My heart went out to your family for the loss of Marian. I loss my mother over 10+ years ago. But I found comfort in these few scriptures. I hope they find comfort for you during this difficult time. Psalms 37:9,-11,29 9 For evil men will be done away with,j But those hoping in Jehovah will possess the earth.k 10 Just a little while longer, and the wicked will be no more;l You will look at where they were, And they will not be there.m 11 But the meek will possess the earth,n And they will find exquisite delight in the abundance 29 The righteous will possess the earth,i And they will live forever on it.j Please look up these scriptures in your own copy of the Bible. It will give you confidence you will see Marian again under righteous condition where she is no longer sick but restored youth and healthy. My Aunt Marian had many accomplishments in life, but her greatest legacy was the love she had for family. She and my Aunt Mary Jane were my baby sitters growing up, and I even lived with them one summer. They were at all of my sporting events, graduations, and any other important event. They had all of us nieces and nephews over on several occasions each year just for fun. My aunts were/are the best at showing they care, being involved in everyone’s lives, and spending good quality time with each of us. They are a big reason my extended family is so close. I didn’t lose just an Aunt this weekend, but a second mom, and a friend. She is missed and loved by so many. I'd just like to say how deeply saddened myself and my wife are hearing this news. My wife was lucky enough to work with Marian at GSA and I was lucky enough to be associated with Marian via the Appraisal Institute! Marian helped me on my journey through appraisal credentialing when she absolutely did not have to. She would go out of her way to make sure I was getting accomplished what I needed to! Without Marian I may not be where I am today. She would go out of her way to find out about our family, how we were doing, etc. Marian was just a great person! And we will miss her!